”We realized that we have ideas, great ideas!” – a heartwarming quote from one of our participants, which exactly captures what we tried to achieve in last weeks workshops. On Friday we finished a successful and challenging week, giving 15 lectures and workshops about conscious consumption, creativity and personal entrepreneurship to ninth graders in Huddinge municipality in the suburbs of Stockholm. The purpose of the workshops was to support youth to explore their own creative minds and empower them to realize that they have amazing ideas and that they can use their own skills and interests to create real change. Another purpose was to introduce the youth to up-cycling - a method to create new things out of old materials or products. Creativity and innovation – tools for creating sustainable change We worked with 15 school classes in total - 30 teenagers in each, three groups a day. During the 90 intense minutes we had for every workshop we worked in a solution-oriented manner, taking on some of the challenges we face through climate change and the patterns of excessive consumption most of us engage in. Focusing on the entrepreneurial spirit in themselves, the participants worked to develop ideas and innovations which can engage people and companies around them to persue sustainable lifestyles and business models. The main question we posed was: How can we use our own skills and interests to trigger others to get involved? What can you make out of used milk cartons? “An iphone cover”, “a hat”, “a castle”, “a house”, “an airplane”, “a dress”, “shoes”, and “a pot” - the participants loudly contributed plenty of answers to this question! We wanted to show the participants that anything is possible and to give an example of alternative and creative ways of conscious consumption. 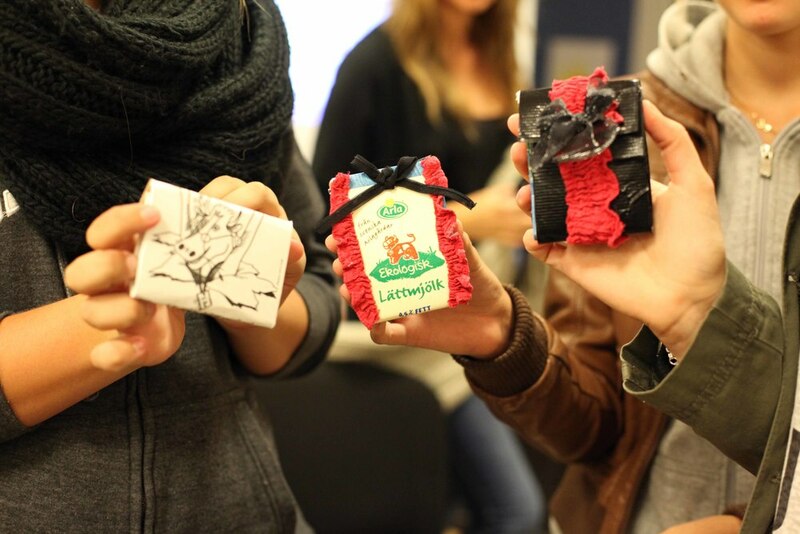 During the last part of the workshop we taught them how to up-cycle milk cartons into wallets, the results were gorgeous! Shifting from giving the right answers to finding the new answers At the end of our workshop some of the teenagers asked: “Do I have to keep this wallet?” This question really frustrated us at first and our immediate reaction was to give them an answer. But, then we realized that this question symbolizes the essence of the problems we see that schools are facing today, many pupils are used to getting answers delivered. They are taught what is wrong and what is right, instead of being challenged to find their own answers and solutions. We ask ourselves why young people aren't asked what they want to do or given the time and opportunity to make their own decisions and realize their own ideas? Teenagers are expected to take responsibility in school – but how can they take responsibility for something they can’t be part of changing? The way we run society is not sustainable on so many different levels. In order to change this we need to find new answers. One part of this societal shift needs to include a school system that encourages and empowers youth to find new answers, ideas and innovations on how we can consume and do business differently! Thank you Rebecka Hagman at Botkyrka kommun for your support! You are a star! And Patrick Lundström at Huddinge kommun for your great work with Handla Hållbart!